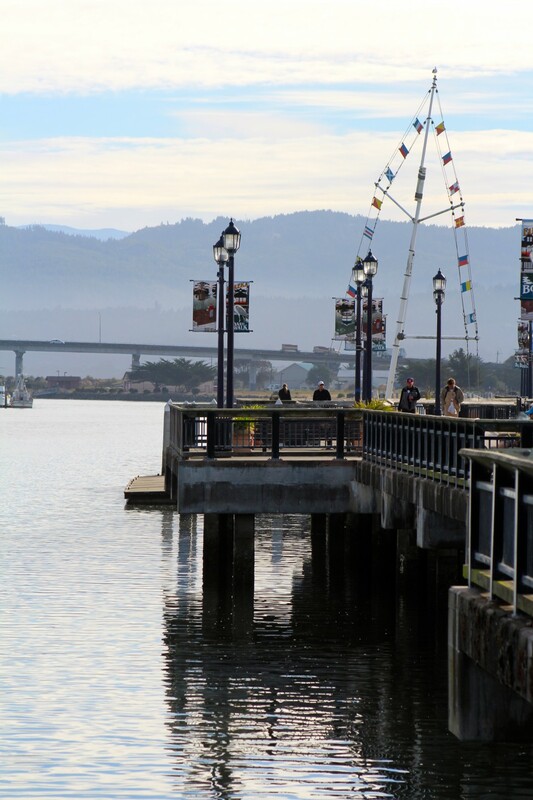 Although not designed for fishing, and not designated as a public pier, the “Boardwalk” in downtown Eureka’s waterfront has become my favorite spot to practice the piscatorial arts. I say this with a word of caution because if anyone wishes to fish from the boardwalk they should be very, very careful to clean up after themselves and not damage the boardwalk in any way. 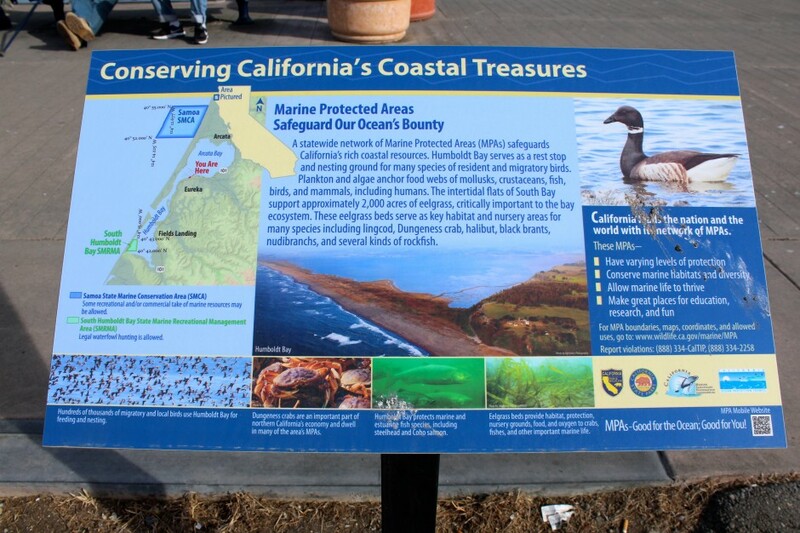 It’s primarily designed as a walkway for locals and tourists and provides some great views that do not need to be marred by trash, fish scales or blood from careless anglers. 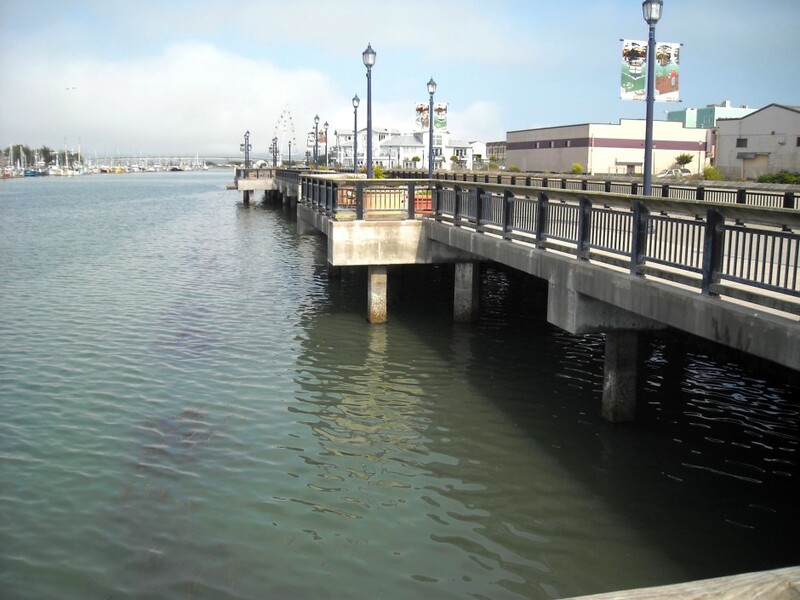 Traditionally my first stop for fishing in Eureka was the Del Norte Street Pier and IT IS the designated public fishing pier. 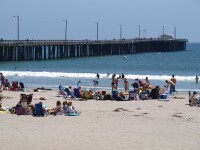 However, the homeless outnumber the tourists in Eureka and when the city decided to allow a homeless encampment adjacent to the pier’s parking lot it made it a dangerous spot to leave the car (since the pier is a long distance from the parking lot). There are homeless at the boardwalk but at the boardwalk you can park your car a short distance away and keep a good view of it. 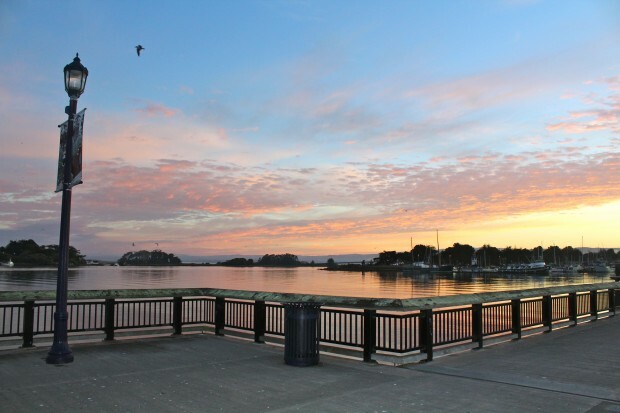 As said, the boardwalk offers great good views of Humboldt Bay. In the distance, a little to the left, one can see Samoa and the North Spit that gives protection to Humboldt Bay. 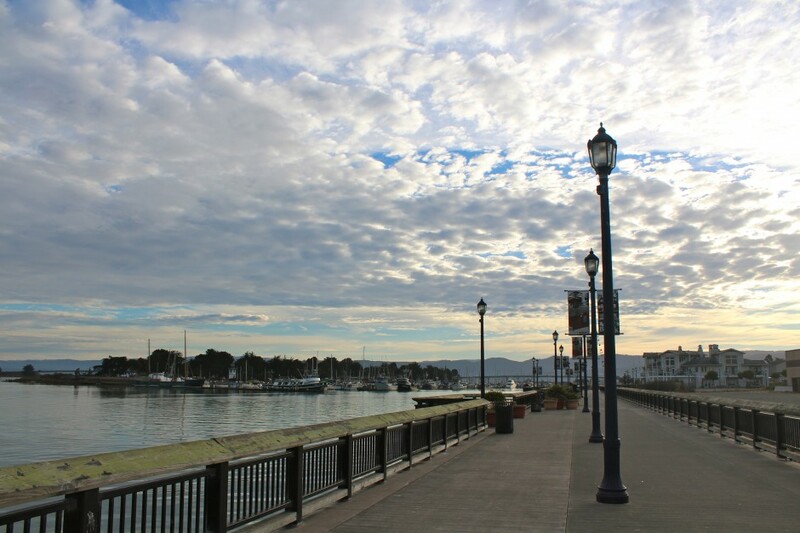 Directly across the bay and its “Eureka Channel” sits Indian Island. A short distance to the right, and across the water known as the “Inner Reach,” sits Woodley Island and its marina. 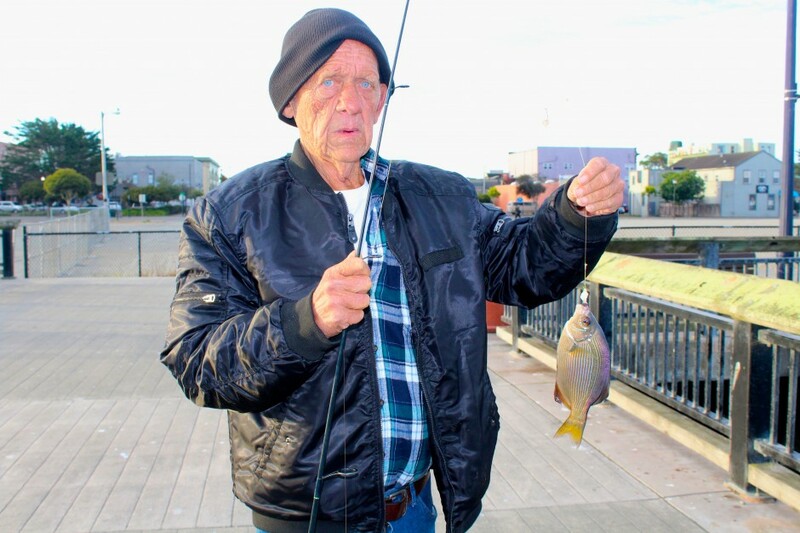 Most important, the boardwalk also offers access to good fishing, something that I have confirmed by my annual trips to Eureka over the past decade. My first visit in 2008 resulted in a decent-sized bat ray while subsequent trips have yielded a variety of perch along with the pelagic species that can invade the bay at different times of the year—anchovies, sardines and herring. Nighttime action can see sharays—sharks and rays, and some flatfish are also to be had but you’ve got to keep the crabs from getting to your bait first. Environment: The boardwalk is basically three blocks long and stretches from D Street to F Street. 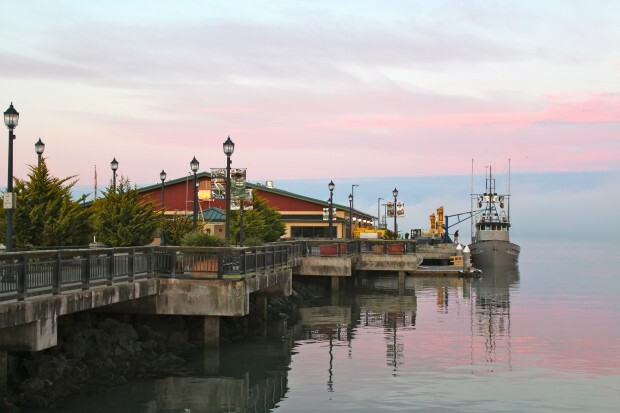 It fronts on Humboldt Bay but behind it sits Eureka’s historic “Old Town” with its beautiful Victorian buildings, various restaurants, and interesting shops. Just a couple of blocks up the hill is the Romano Gabriel Sculpture Garden and a block further sits the Clarke Historical Museum with its treasure trove of Native American and Gold Rush era artifacts. All in all it’s an interesting area for both the angler and non-fishing members of the family. 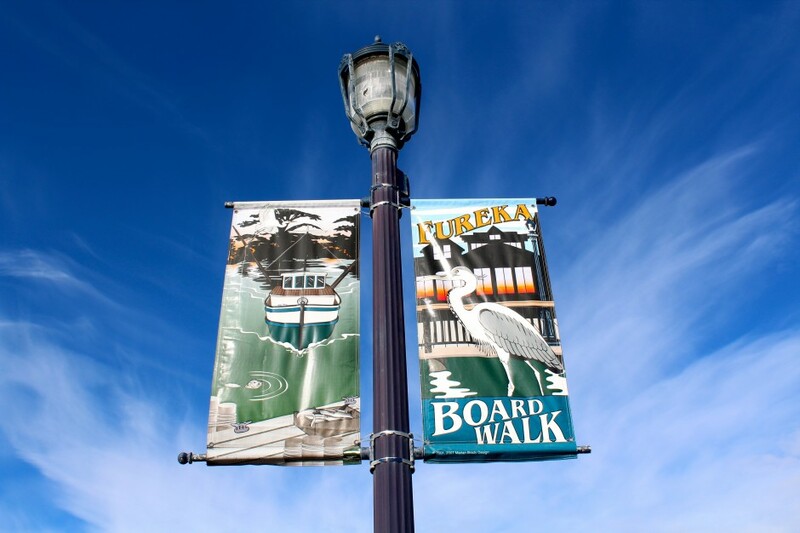 Eureka has put a lot of effort into sprucing up its waterfront area and it’s hoped the efforts continue. Many, including myself, feel it may be the best part of Eureka. To be honest though, there always seems to be a few “characters” hanging around the area. Some are obviously homeless and some have drug and/or alcohol problems. 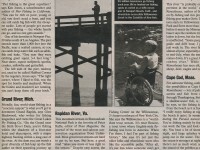 I’ve never had a problem but I do keep a close eye on my pier cart, camera and rods when I am fishing. 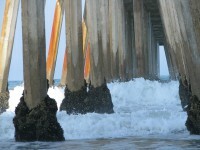 I have met and talked to a lot of interesting people on the boardwalk and I have heard a lot of interesting stories. 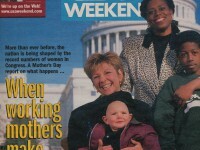 As said, I’ve never had a problem. Nevertheless, if you want to fish the area at night it might be better done as part of a group. 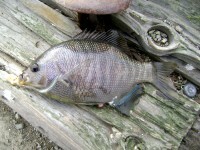 The fish: Inshore, by the boardwalk and its pilings, is the territory of perch and a number of different species are caught. Smaller walleye and silver surfperch are common most of the year while the larger redtail surfperch are typically caught in the spring. Large white seaperch and striped seaperch can be found year round. Far too common are the small shinerperch that can be a pest when grabbing baits intended for the more favorable perch. Also too common are the staghorn sculpins (bullheads) that can be found from the shallows out to deeper waters and will often bite on bait and hooks seemingly much too large for their size. At times, especially during the summer months, you may also catch a few small, mostly juvenile, rockfish with brown rockfish leading the list. Occasionally a larger brownie or grass rockfish may decide to join in the fun but they are less common than the perch. One morning a local walked over to see what I was catching and noticed a tap on my rod. Yes, I mentioned, a perch is checking out the bait. Soon after, I pulled in this white seaperch and I asked him if he would mind holding the fish for a picture. No problem! I released the fish to fight another day while my new found friend described his career as a fisherman in Alaska, Oregon and California. His stories of giant halibut and hard fighting salmon seemed to make my perch pale in comparison but that was then and this was now. 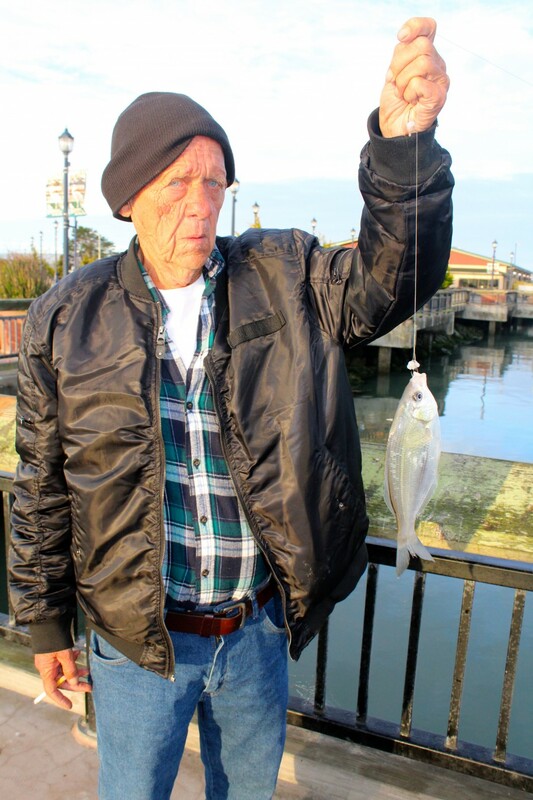 Flatfish—California halibut, starry flounder and a few sole and sanddabs, can also be found on the bottom but generally are a ways out from the boardwalk. Sharays—Sharks and rays, primarily dogfish sharks, leopard sharks, bat rays and big skates are found in decent numbers but are more common at night and few fish for them from the boardwalk. 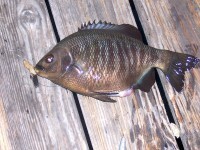 Top-water fish can be plentiful. Both jacksmelt and topsmelt are common and can be caught in fair to good numbers much of the year. Some years sees good runs of Pacific sardines (summer-fall) as well as Pacific herring (winter-spring). Anchovies are found most summer to fall months and can be in almost unbelievable numbers. The Crustaceans: Crabs are both a blessing and a curse. A blessing because they can be taken in good numbers during the crabbing season. A curse because they are found in the bay year round and sometimes seem to cover the bottom waiting to grab the baits intended for fish. Fishing Tips: Anglers can pick and choose which species and associated techniques they desire. Basically four methods of fishing are employed. 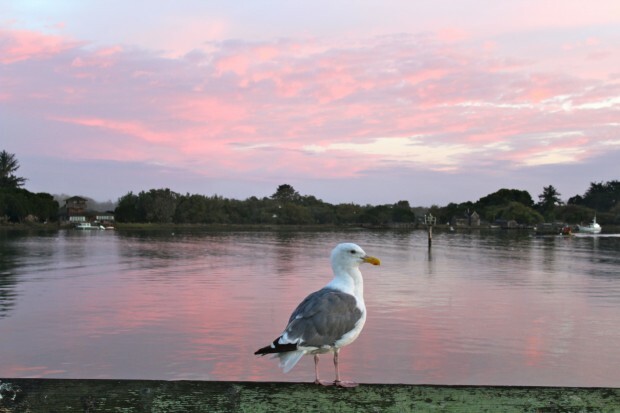 If seeking out perch, the inshore waters are where you will typically find them and by far the hours before and after high tide is optimum since this is also shallow water. 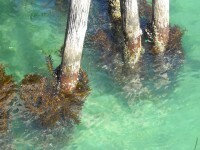 Under and just out from the Boardwalk there are both rocks and kelp to attract the perch. I typically fish on one of the extensions that poke out from the main walkway and thus can fish along that extension or even cast back under the walkway toward the rocky shoreline. You may need to try different areas but I’ve always been able to find some fish. At low tide your options are more limited but usually a drop of the line straight down from an extension will find some fish. 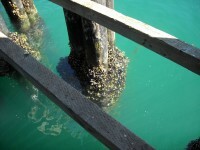 As for the bait and technique, it’s the same bait that works in most bay environments. Ghost shrimp and sea worms are optimum but you will not find them in local bait shops. More common is market shrimp, mussels and a small piece of either placed on a high/low rigging with No. 8, 6 or 4 hooks is all you need. If you find a school of walleyes or silver perch you could try a Sabiki-type bait rig but here the water is typically too shallow for bait rigs to be effective; I much prefer to simply place a couple of small hooks on the line. And, I almost always am holding my perch rod since you want to feel the bite and react properly. Setting your rod against the railing and waiting definitely produces less fish. 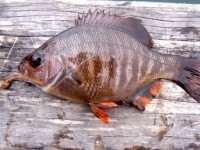 The large redtail surfperch are more common in the bay during the spring months (March-May) when they enter the bay to spawn. White seaperch and striped seaperch seem to be present much of the year but both do seem in greater numbers during the spring months. The larger perch are typically caught on the bottom while walleyes and silver are often mid-depth. Shinerperch are just about everywhere and, unfortunately, are great at stealing the bait intended for the larger perch (such is life). 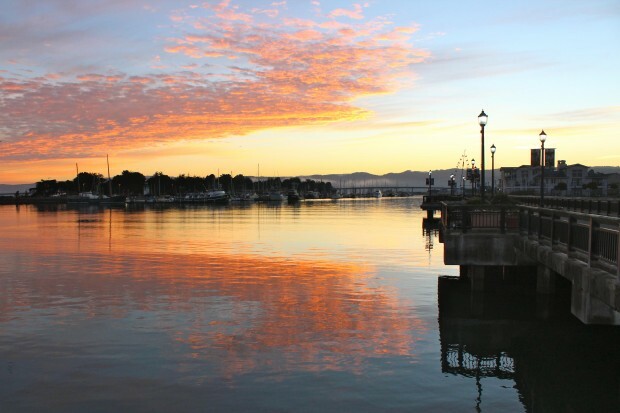 The second fishery is that for flatfish and the main prize is California halibut. Typically they begin to show up around April while peak action is during the summer months, July thru August. Since halibut are ambush predators, a moving bait typically works better than a bait simply sitting on the bottom. Casting a Carolina-type rig baited with a whole anchovy or small sardine/herring can attract a halibut but it’s recommended you cast out and then begin a slow retrieve. A live-bait (anchovy, sardine, etc.) can also work. The problem here is the number of crabs and at times they make it hard to fish any soft-fleshed baitfish such as these. 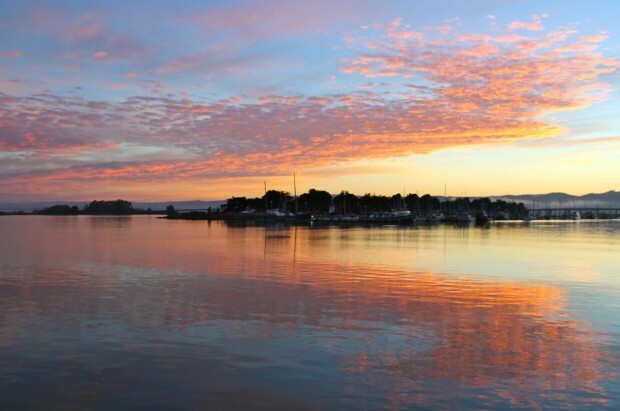 Artificial lures such as Scampis, Big Hammers, Fish Traps and Lucky Craft lures (among others) are proven lures for halibut and will avoid the crabs—as long as the bay’s eelgrass is not flowing as sometimes happens. The halibut can range from a couple of pounds up to 15-pounds or more. Starry flounder prefer sea worms and live shrimp (ghost shrimp or grass shrimp) but again those live baits are hard to find locally. More common will be pieces of market shrimp, salted mussel (that is tough), pieces of clams or strips of squid. They will also take strips of anchovy but again the problem is keeping the crabs from getting them first. Tackle can be either a Carolina-type rigging or high/low generally with No. 4 hooks. A medium cast out from the Boardwalk will find them if they are around and often the winter months are the best for the starries. Small sand dabs, usually Pacific or speckled sanddab may also enter the catch but there numbers are not big. A high low utilizing size 6 hooks and small pieces of bait is generally the preferred method. The third fishery is for sharays—sharks and rays, with dogfish and leopard sharks leading the shark parade, bat rays leading the parade for rays. Big skates, not just their name but also reflecting their size (some over a hundred pounds in weight) are also commonly encountered. All are caught on the bottom and the prime time for all is the nocturnal hours when most sane citizens are safely ensconced in their beds (hopefully with happy dreams). Shark anglers are after big game and a five-foot long leopard shark, a hundred pound “mud marlin” (bat ray) or huge big skate will yield some satisfaction (until the next night). 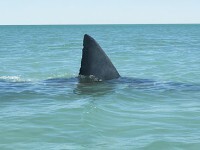 If a huge 7-gill shark shows up they may be sated for two nights. High/low rigs or Carolina rigs with size 4//0 to 6/0 hooks will work for most species. 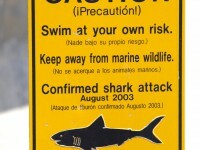 Sharks seem to prefer a whole fish (herring, sardine, jacksmelt) while the rays seem to prefer squid. Given the attention from crabs the tougher squid may be the best way to go. Heavier line and larger hooks are needed. By the way, landing a large sharay can be a project unless you have some friends along to man the nets. At the south end of the Boardwalk is a dock that is a good place to land sharays. The final fishery is for the top-water species, fish that are pelagic in nature—herring, sardines and anchovies. When present, and often the sight of diving birds will indicate their presence, they can be hooked on a Sabiki-type bait rig. Generally you do not need any bait on the hooks, simply attach a torpedo sinker to the end of the rig and start casting. Sometimes they are on the top; sometimes you need to let the rig sink mid-water before retrieving. Sometimes a steady retrieve works sometimes you want to reel, rest, reel, rest—try different techniques until you find the one that works. And remember, reel all the way to the Boardwalk since often the fish will be in waters adjacent to where you are casting. If done properly, you may be able to catch 2-5 fish on every cast. It’s great fresh bait and live bait for the flatfish. As for hook size, it depends on the baitfish that are present. Generally the smaller hooks work best, obviously for the anchovies but also for the slightly larger baitfish. Too big of a hook on the bait rig and you will simply hook less fish. While the sardines and herring seemingly come and go, virtually every trip I have made to the bay during the late summer to Fall months has seem big schools of anchovies. Jacksmelt also fall into this top-water fishery and they too can be caught on the bait rigs (although I prefer a couple of small hooks rigged on a high/low above a torpedo sinker). Size 8 or 6 hooks generally work best and though sometimes the jacksmelt will hit bare hooks, often they want a small piece of bait—worm, shrimp, or strip of squid or mackerel. If finicky, they may prefer a number of small hooks fished under a float of some type with the hooks being from about two feet under the top of the water down to about 5-6 feet under the top. Large jacksmelt put up a good fight on light tackle and are fun to catch. Facilities: Lights and trash cans. Location: 100 F Street, Eureka. 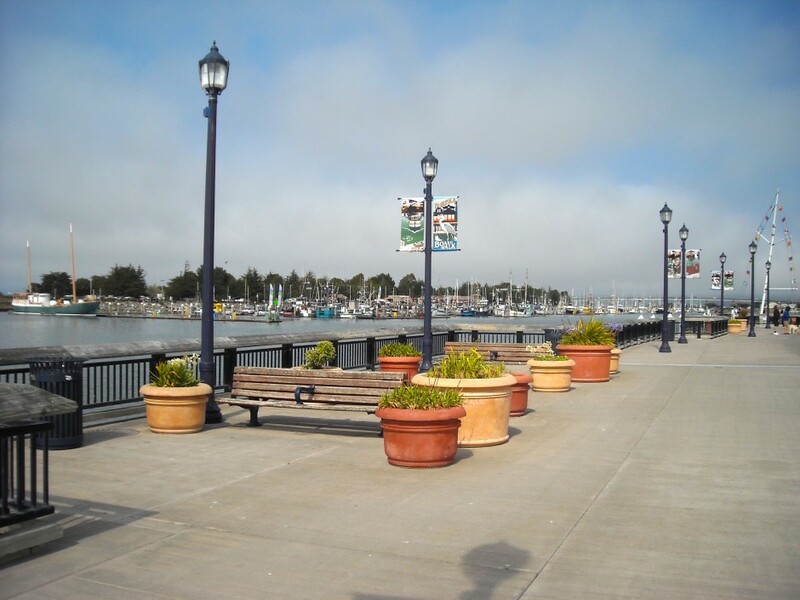 How to get there: Take Highway 101 (north or south) and turn on to F Street and follow it toward the bay and the boardwalk. 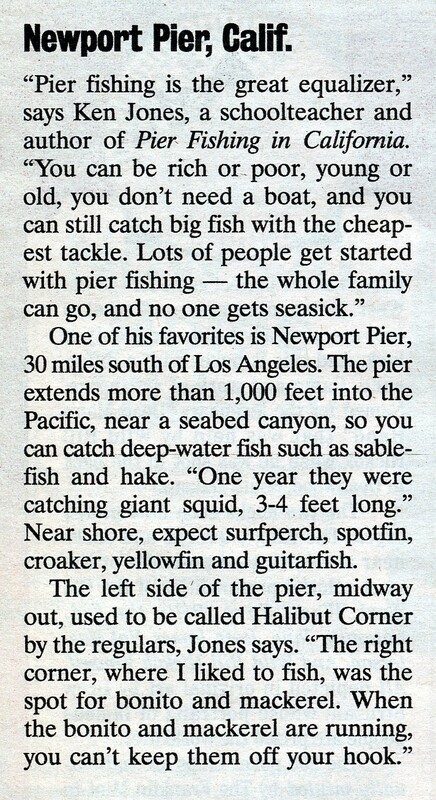 Posted in California Piers, Daily musings... and tagged with California piers, Eureka Boardwalk, Pier Fishing in California, pierfishing, saltwater fish, saltwater fishing. RSS 2.0 feed.